HYPOTHESIS: Lung transplant candidates are prone to GERD as well as anatomic and motility disorders of their esophagus. GERD and aspiration may contribute to the development of bronchiolitis obliterans, resulting in accelerated graft deterioration following lung transplantation. 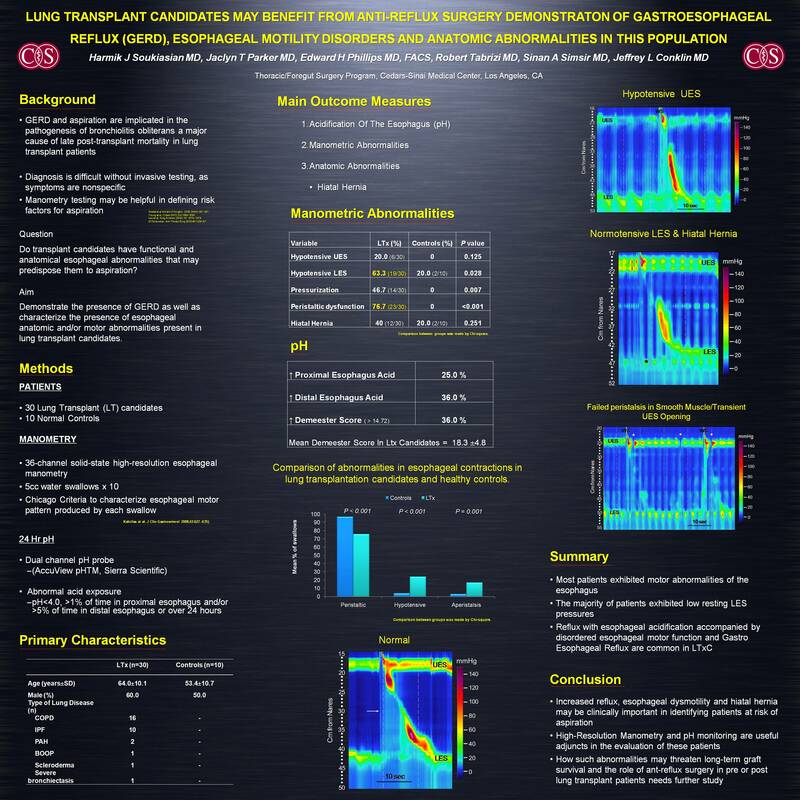 However, it is not well known whether Lung transplant candidates have functional and/or anatomic abnormalities of their esophagus that may predispose them to reflux. OBJECTIVE: Demonstrate the presence of GERD as well as motor and anatomic abnormalities of the esophagus in Lung transplant candidates. METHODS: All lung transplant candidates were evaluated (n = 30). They underwent High Resolution Esophageal Manometry with a 36 channel probe, as well as 24hr-pH monitoring using a dual channel pH probe. The main outcome measures were; Acidification of the esophagus, esophageal dysmotility and anatomic abnormalities such as hiatal hernia. RESULTS: Overall, 76.7% (23/30) had some form of peristaltic dysfunction; 60% (18/30) had hypotensive Lower Esophageal Sphincter; 40% (12/30) had a short esophagus / hiatal hernia; 36% (11/30) had a positive DeMeester score, average = 18.3, Range = 0.2 – 96.2; 20% (6/30) had hypotensive Upper Esophageal Sphincter. CONCLUSIONS: Reflux with Acidification of the esophagus accompanied by numerous anatomic and motor abnormalities of the gastro-esophageal junction as well as the esophageal body, are common in patients awaiting lung transplantation. Increased reflux accompanied with esophageal dysmotility and hiatal hernia may place these patients, with subclinical as well as clinically apparent esophageal disorders, at risk of aspiration. These evaluations may determine the role of ant-reflux surgery in pre or post lung transplant patients.